This building was the first of two identical, adjacent structures erected in 1882-83 for the wholesale grocery business of Turner, McKeand, and Company. Designed by architects Mancel Willmot and George W. Stewart, the building at 137 Bannatyne Avenue featured light-coloured brick while its twin was built of red brick. When completed, the building was occupied by the wholesale commission merchant partnership of W. F. Henderson and Manlius Bull. After Henderson’s retirement, Bull operated the firm alone until selling it to Edward Nicholson, who later partnered with Donald H. Bain in a building a short distance down the street. J. Y. Griffin & Company, a pork-packing firm, occupied the building from 1890 to 1898, when it was purchased by grocers Albert Bright and Kenneth J. Johnston. 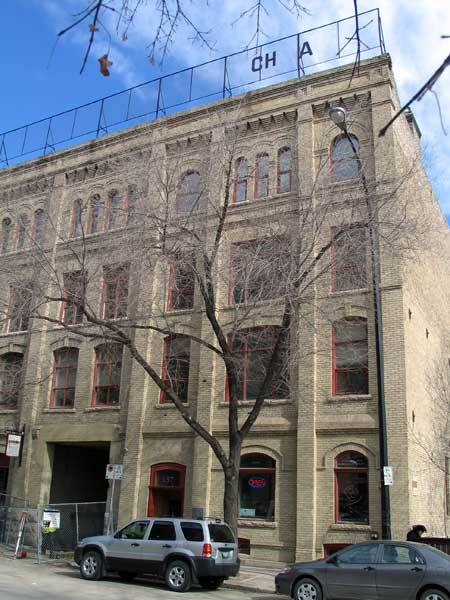 In 1903, Bright and Johnston commissioned local architect J. H. G. Russell to design a four-storey addition at 141 Bannatyne between Willmot and Stewart’s twin structures, to which they moved their business in 1904 and leased out 137 Bannatyne. Following a fire in 1907, Russell was given another commission to extend the fourth storey of the addition across to 137, thus unifying the two structures. The addition at 141 Bannatyne suffered fires in 1915 and 1926 but 137 escaped major damage. Johnston left the firm in 1908 but Bright’s sons joined it to form Bright and Sons Crockery Wholesale, who operated until being taken over in the 1920s. Several other companies occupied the building, which became known as the J. G. Building in 1949, then later as the Swiss Building. In 1987, it was renovated as residential condominiums and ground-floor commercial space. This municipally-designated historic site provides offices for the Manitoba Association of Architects. Swiss Building / Bright and Johnston Building (137 Bannatyne Avenue), City of Winnipeg Historical Buildings Committee, November 1984. “Groceries and provisions,” Manitoba Free Press, 20 December 1890, page 9.